A customer is for life not just for Christmas – how to make your contact centre impress when it matters. This Christmas it has been the year of doing your shopping online. This year saw an approximate 85 million visits to UK e-retailers on ‘Cyber Monday’ on December 5 – the biggest ever and an 18 per cent increase on last year. But what does this mean for contact centres? 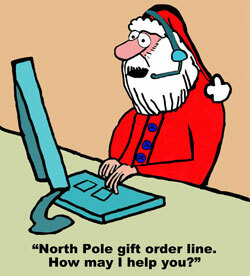 With Christmas gifts come the inevitable returns rush and the associated customer service queries. In the pre-Internet days, frazzled shop assistants dealt with it in store but, in today’s ecommerce age, the only way an online retailer can deliver direct, personal service is through its call centre. Customers place a lot of emphasis on Christmas so it’s important to get it right if you want repeat business in the New Year. Customer contact centres need to provide seamless, personalised services to impress today’s consumers. Technology exists that enables contact centres to personalise the customer experience, so they can speak to the same operator every time, first time. Traditionally, contact centres were interested in managing calls effectively to increase profits, focusing on call duration and first contact resolution as core metrics. Now, they have realised that improving the customer experience will have a better, long-term impact on the bottom line. As a consumer, dealing with a call centre is one of the easiest ways to identify if customer service is a priority for that organisation. Companies that are getting it right include Groupon, which improves its customer experience, increases loyalty and improves business efficiency by using Natterbox. For example, Groupon’s London-based call centre is staffed by regional experts from all over the UK. Natterbox’s cloud-based system automatically recognises the geographic location of individual callers and intelligently routes them to a regional expert. The experience for the customer calling from Edinburgh, for example, to discuss a Groupon deal in their city, is greatly improved because the agent has knowledge of the area and local offers. This empowers an international organisation with a localised voice. It is this level of personalisation that UK contact centres need to achieve if they want to develop loyal customers and the revenue benefits that will ensue as a result. Personalising the customer experience also involves storing the callers’ preferences so that they get a consistent service. From recalling their favourite hold music to automatically connecting them to the same operator each time, with Natterbox every telephone number can hold a wealth of customer and business information. Part of providing a seamless customer experience, particularly over the Christmas holiday period, when staff are on leave, can involve creating the ‘mobile contact centre’. Natterbox Voice Anywhere MBX removes the restrictions of desk-bound, office-based landline phones to maximise mobile workforce efficiency. Although remote working is not a new concept, mobiles have previously been somewhat out of sync and separate from the office communications flow. MBX is different to both on-premise PBX and Hosted PBX because it does not require the use of landline phones. Instead the service provides all the functionality of a landline phone on a mobile device. This ‘frees’ voice from the office to mobilise your workforce while maintaining all the ‘credible’ features of a static landline setup (IVR switchboard, call transfer, hold etc). Maintaining business continuity over the hectic festive period is a challenge for retailers but an important thing to get right. Neil Hammerton is CEO at Natterbox. Natterbox was launched in 2010 to revolutionise the telecoms industry. Core services, such as its real-time voice integration with CRM systems, including Salesforce.com are available for organisations that wish to turn the power of voice into reporting and analysis that can greatly improve a customer’s experience with its brand. How to Give the Best Service: Just Be Nice!